What a difference two years makes! 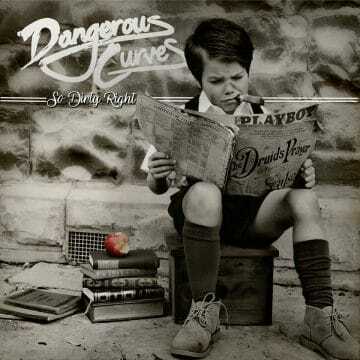 After releasing their debut self-titled EP two years ago which contained five pretty good but not that memorable tracks, Dangerous Curves have come back with a very good and way more mature effort titled So Dirty Right. Gone are the speedier and too busy tracks and in are some grooving tracks highlighted by what could well be a hit single! A hit single you may ask? Yes, you’re reading this right. Had Dangerous Curves released their So Dirty Right album back in the late ’80s, I am convinced that their acoustic gem “I Need Lovin'” complete with some female background vocals and a real good time feel would be a bonafide hit for the band. The song stands head above shoulders over the rest of the tracks on So Dirty Right and it’s not because the rest of the songs are bad in any way, it’s just because “I Need Lovin'” is so damn good, catchy and infectious. Hopefully the song will get the video treatment very soon because it really deserves it and you, the reader, need to hear it! I can’t say enough how surprised I am with Dangerous Curves‘ sophomore effort. It’s just so much better than the first EP. I even revisited the debut EP to see if I might have been wrong with my initial assessment from two years ago (I stand by what I initially wrote) and to compare it to So Dirty Right. As it turns out, there is no comparison. So Dirty Right is just a much better, more mature and stronger record with better production, superior songs and finally some memorable melodies. It feels like Dangerous Curves have definitely elevated their game with So Dirty Right to the point that they can now be considered among the sleaze rock elite. Art Of The Heart is the first single taken from the album “So Dirty Right” out on April the 6th 2018 . PRE ORDER NOW! Bandcamp: https://dangerouscurves.bandcamp.com/ Web: https://dangerouscurvesrock.com/ Facebook: https://www.facebook.com/dangerouscurvesrock/ Video: Will Cook at Up Creative. Art Of The Heart is the first single taken from the album “So Dirty Right” out on April the 6th 2018 . PRE ORDER NOW!